The Balchen family unites with the Man family at the point when on 26 February 1746/47 Mary Balchen (1721 – 1798) married John Man (1718 – 1783). Three other families connected with the Balchens are the Barnes, Cumberland, and Craddock families. 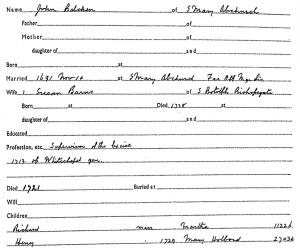 Below is Mary (Balchen) Man’s burial record dated 23 October 1798. Her place of death is given as St. Mary, Newington, her age 77, and cause of death ‘Decline’. (Mary’s is the second to last entry). 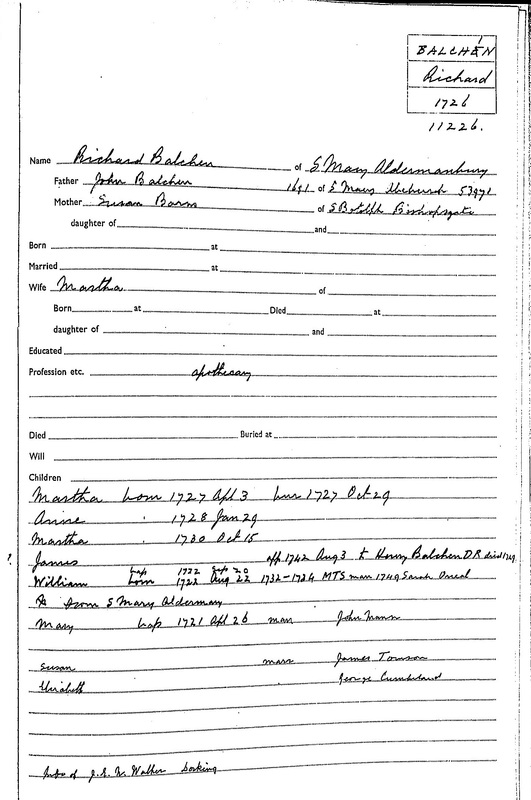 Mary (Balchen) Man’s Burial Record (second to last line). Mary’s father was Richard Balchen and her mother was Martha Hitchcock. Richard was the eldest child of John and Susannah (Barnes) Balchen. John Balchen was born in Bramley in Surrey in 1655 and baptized at Holy Trinity, Bramley, on 10 October 1655. He married Susannah Barnes on 10 November 1691 at St. Mary Abchurch, London. John died in December 1721 and was buried on the twenty-ninth of that month at St. Mary, Whitechapel, London. Susannah was the daughter of Henry Barnes and Susannah Craddock. She was born in 1663 at Weston, Near Bath, Somerset. Below, the death notice for Susannah (Barnes) Balchen in a London newspaper dated 28 March 1737/38. She would have been 75 years. 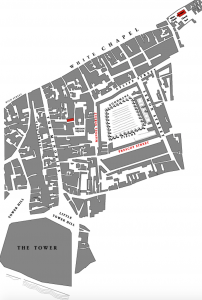 Susannah (Barnes) Balchen was buried on 29 March 1737/38 at St. Mary, Whitechapel. She left a will that can be read HERE. RICHARD BALCHEN, b. 1692, Whitechapel, London; d. 1738, Whitechapel, London. SUSANNAH BALCHEN, b. 1694, Whitechapel, London; d. 1721, Whitechapel, London. JOHN BALCHEN, b. 1696, London Stone, London; d. 26 Jul 1742 at Canton, China. HENRY BALCHEN, b. 1698; d. 1780. MARIA BALCHEN, b. 1702, Weston Near Bath, Somerset. 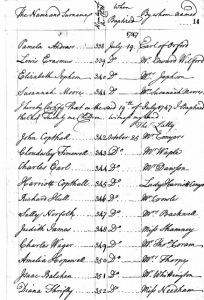 Richard appears alongside his brother Henry on Boyd’s Index of London Inhabitants (below). The family is headed by their father John Balchen. His profession is indicated as ‘Supervisor of the Excise’ (Customs). SUSANNAH BALCHEN was born in 1716 and baptised on 5 August at St. Botoloph’s. She died in 1771. She married James Thompson. MARTHA BALCHEN was born in 1717 and baptised on 7 November 1717 at St. Martin Vintry. She died soon after. MARY BALCHEN, was born in 1721 and died in 1798 at Walworth Common, Surrey. She married John Man. WILLIAM BALCHEN was born in 1722 at Mile End and baptised on 20 September 1722 at St. Mary Aldermary. William died in August 1765 and was buried on the thirtieth of that month at St. Mary, Whitechapel. JAMES BALCHEN was born in 1724. He died in February 1748/49 and was buried on 4 March 1748/49 at St. Mary, Whitechapel. (See also his journal). He left a will which has been transcribed and can be read HERE. ELIZABETH BALCHEN was born in 1726. She married George Cumberland. She died in October 1727 and was buried on the ninth of that month at St. Mary Aldermanbury. MARTHA BALCHEN was born in September 1730 and baptised on 20 September 1730 at St. Mary Aldermanbury. Martha died in July 1731 and was buried on the twenty-fourth of that month at St Alban, Wood Street. 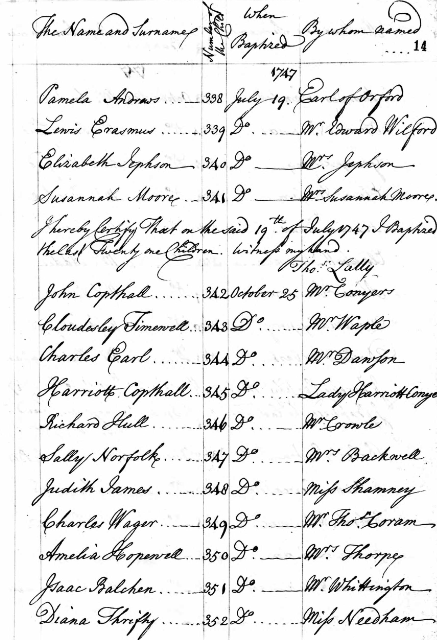 Richard’s family also appeared on Boyd’s Index of London Inhabitants (below). The most renowned Balchen was Admiral Sir John Balchen. However his exact genealogical relationship to the Balchen family described on these pages has yet to be demonstrated. Indeed it has become increasingly obvious that, although there may be a very distant relationship, the admiral was NOT in fact the uncle of Mary Man and her sister Elizabeth Cumberland as the two ladies and their descendants have claimed. The confusion surrounding the relationship between the Admiral and this Balchen family has been described here. The Balchen / Balchin Family Society actively maintains contact among the members of the family and they have a web site HERE. That web site consists mostly of data about the Surrey Balchens / Balchins of Godalming and Guildford. The family often spills across the border into Sussex. The Balchen family on these pages, although very probably related to the Surrey (Sussex) family, is from London and so far no clear link has been established among: i) the Admiral’s family, ii) the Surrey (Sussex) Balchins, and iii) the London Balchens (as listed below). However, all that is needed to demonstrate a relationship, if there is one, is some careful research which has yet to be done. (see also the Cumberland Family). Given the rarity of the name and the concentration of its occurrence in just one small corner of Surrey /Sussex, it is most likely that all those bearing the name ‘Balchen’ are in some way related to each other. 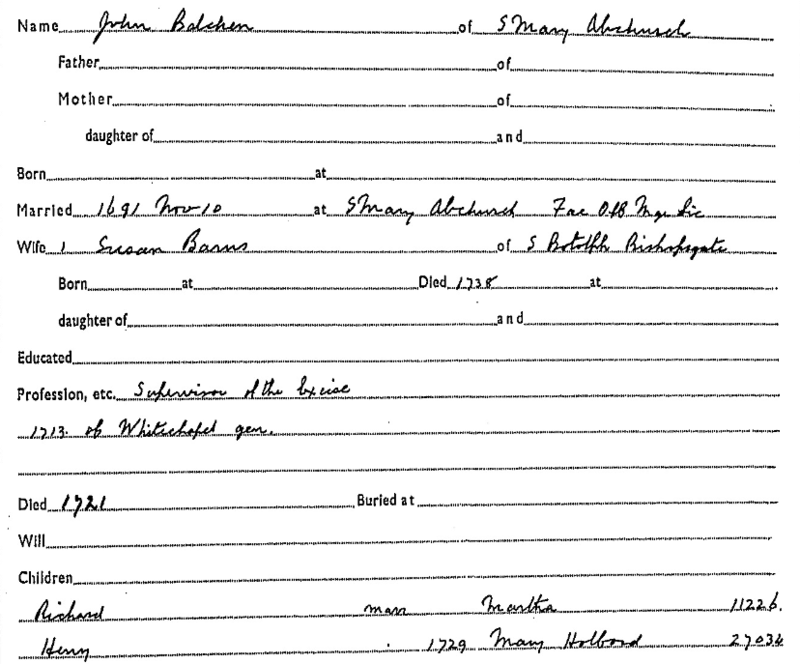 As noted, Mary Balchen was born in London in 1721, the third child of Richard Balchen and Martha Hitchcock. She was baptized on 26 April at St. Mary Aldermary, London. She married John Man on 26 February 1746/7 at Holy Trinity Church, The Minories, London. (Their marriage license has been found.) Mary died in October 1798, at her youngest son’s (James) home at Kings Row, Walworth Common, Surrey, and she was buried at St Mary Matfellon, Whitechapel, Middlesex on 23 October 1798. Mary Balchen is described by Clementina Black in her book ‘The Cumberland Letters’ as a difficult and cantankerous woman. She was an object of frustration for the Cumberland brothers (Richard and George) who needed their aunt Mary (Balchen) Man to agree to the release of various trust monies. For more details see the Man- Cumberland – Balchen Letters. James Balchen (1724 – 1748/49), brother of Mary Man, wrote a description of visiting his new Man in-laws in 1747 and this can be found HERE. A court case involving Henry Balchen (Mary’s uncle), Martha Balchen (Mary’s mother), Elizabeth Balchen (Mary’s sister), George Cumberland Sr., Sarah Boulter (nee Cradock), and others can be read HERE (<— in pdf). A Balchen family genealogy and consisting of a 29 page pdf document can be read HERE. Richard Balchen and Martha Hitchcock were married on 19 October 1715 in London. The source for this marriage on the International Genealogical Index (IGI) was a Batch # I025702. What is odd about this number is the prefix “I” before the batch number. 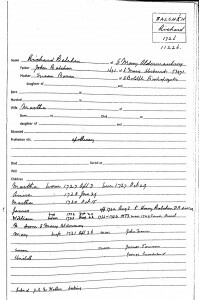 Ed Man, who found the marriage record on the IGI, sent an email enquiring about the meaning of the “I” prefix to the Family History Center of the Church of Latter Day Saints and they explained the prefix and number as follows: “The film that batch number I025702 was extracted from is #815482 Clandestine baptisms and marriages performed by suspended ministers in the Fleet Prison Chapel in the city of London : Mayfair Chapel in the parish of St. George, Hanover Sq. 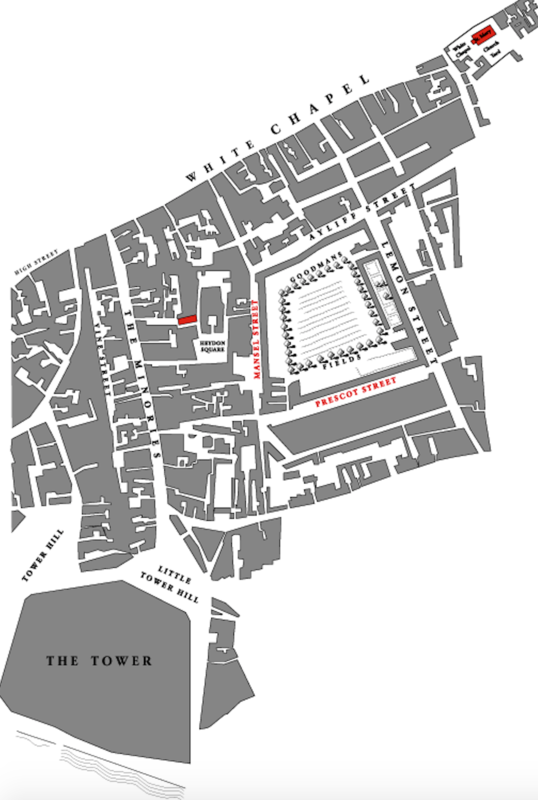 Westminster; King’s Bench Prison, and The Mint, in the borough of Southwark, 1667-1754. ” A copy from the film indicating Richard and Martha’s marriage is below. A transcription of what the record is believed to show is: “Richard Balchen Apothecary Common Garden and Martha Hitchcock”. Fleet marriages were irregular ceremonies that took place in an area centred on the Fleet prison in London during the later 1600s and first half of the 1700s. They were speedy marriages of convenience carried out by ordained clergymen who had no parochial allegiance to the Bishop of London. Often they were debtor prisoners themselves who were allowed to live within close proximity of the Fleet Prison. ‘Rules of the Fleet’ marriages were initially carried out in the prison chapel but as the practice became more popular then other local ‘chapels’ were set up in nearby taverns, coffee house, chambers and shops. Parsons’ fees were charged according to prevailing market forces of urgency and necessity for a quick wedding service, often with only 24 hours notice. Occasionally, Fleet parsons were prepared to travel into the surrounding countryside – with the added bonus of travelling expenses. No banns or licences were required but a record was kept by an accompanying register keeper and hence many of these records now survive in The Public Record Office. 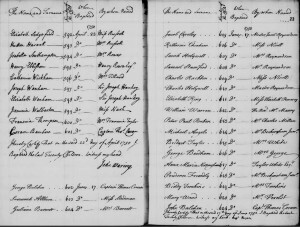 Strangely, unlike parish registers of that period, these records contain details of occupations, marital status and home locality and are therefore of interest to those trying to track down their family history in counties surrounding London. There were more than 200,000 marriages (and some baptisms) performed at the Fleet prison, Mayfair Chapel, and The King’s Bench among others. A chart displaying some of these Balchen relationships can be viewed HERE. In the will of a certain Edward Balchin Wheelwright of Horsham, Sussex, he appoints as his executor his ‘loving kinsman’ John Balchin of Whitechapel. Since there are no records yet found linking the Surrey/Sussex Balchins with the London Balchens this one reference takes on particular significance. Ed Man wrote some notes on this and these can be read HERE. 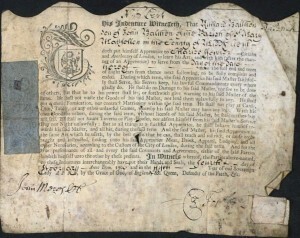 Edward signed his will on 5 June 1712 and it was proved on 15 July 1712 so he died soon after signing. 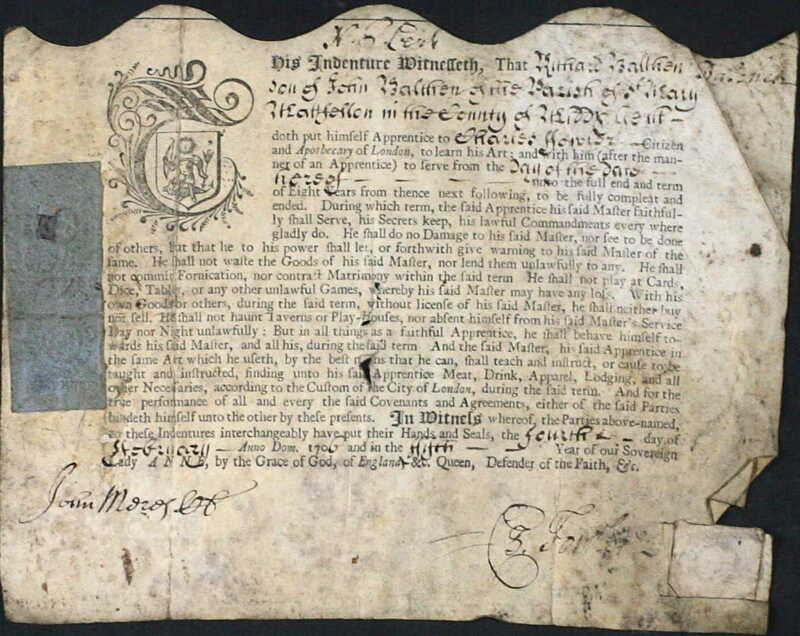 There is only one John Balchen alive in 1712 whose age would be appropriate to qualify as the executor of a will, as well as the fact that he is living in Whitechapel, and that is John Balchen (1658 – 1721) who is the grandfather of Mary Balchen who married John Man. From the will we gather that Edward is a widower and that he has two married daughters: Elizabeth and Rachell. Elizabeth is the wife of George Sayers (yeoman). Edward mentions two of their children (Mary and Elizabeth). He also bequeaths to his second daughter, Rachell Lancaster, wife of John Lancaster. In the will, John Balchen is called a ‘Supervisor of the Excise’ which would indicate a fairly substantial government office. To read Edward Balchin’s will in PDF (three pages) please click here. Rachell – b. 19 Feb 1663/64 in Horsham, Sussex; c. 25 Mar 1664; m. 19 Sep 1687 to John Lancaster. Thomas – b. 13 Mar 1665/66 in Horsham, Sussex; c. 17 Apr 1666; found a marriage at Bramley but inconclusive. Edward – b. 15 Feb 1667/68; c. 08 Apr 1668. Elizabeth – c. 05 Jun 1703. died before 1705. Elizabeth – b. 19 Jun 1705; c. 24 Jun 1705. Mary Sayers another daughter of George and Elizabeth (and mentioned in her grandfather Edward Baltchin’s will) has not been found on the IGI, yet. [Part of a letter included by Clementina Black and was written by Richard Cumberland to his brother George in 1773]. Ann had three illegitimate children. 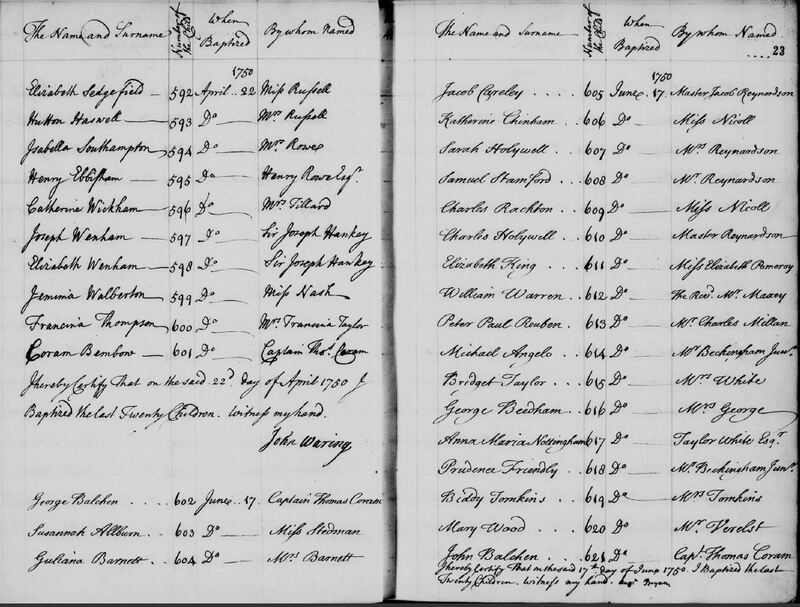 The first she named Isaac and he was baptised at the Foundling Hospital in October 1747 (second to last line below): The second two she named after her two bothers in law and who appear on the pages of the Foundling Hospital baptisms below. 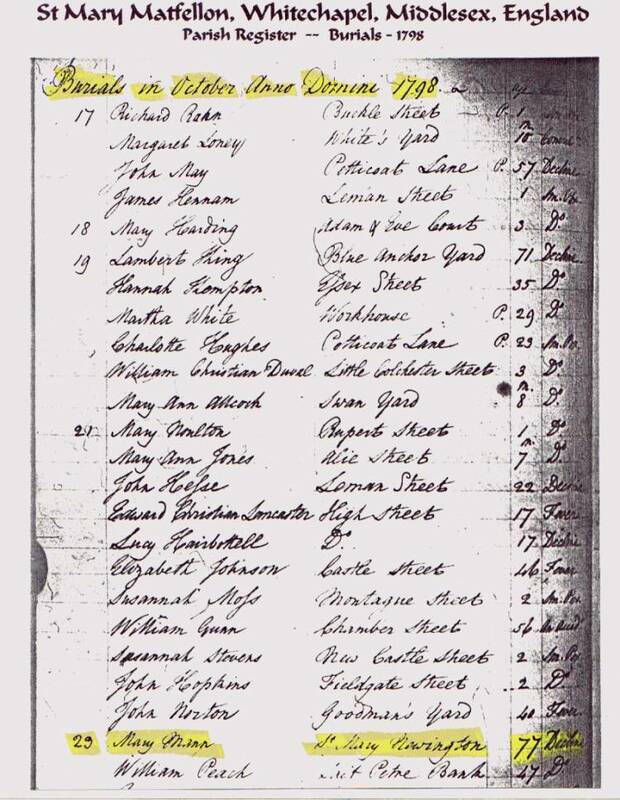 The Balchen family connects with three other families: The Barnes Family where Susannah Barnes marries John Balchen, Cumberland (Mary (Balchen) Man’s sister Elizabeth having married George Cumberland), and Craddock (Susannah Craddock being Mary’s grandmother).